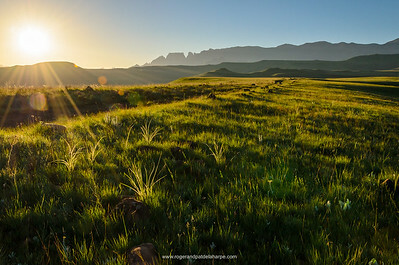 Five interesting Facts about the Drakensberg - Roger and Pat de la Harpe Photography - Photographs, Video and Stock Images. 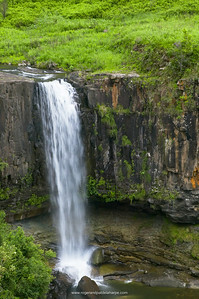 Five interesting facts about the uKhahlamba Drakensberg Park. 1. 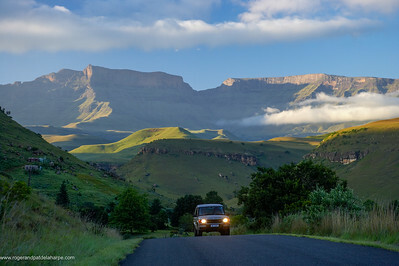 The massive Drakensberg mountain range forms the border between KwaZulu Natal and the Kingdom of Lesotho. Its towering basalt peaks and buttresses offer dramatic vistas, the highest peak reaching a spectacular 3482 metres - the highest in South Africa. 2. The Amphitheatre in the northern Drakensberg, dominated by the Mont-aux-Sources, is particularly magnificent and it is here that the powerful Tugela River tumbles 900 metres down the escarpment. The pinnacles and crags provide a home for numerous raptors including black eagles, Cape vultures and the rare Lammergeyer or bearded vultures. 3. The foothills of the mountains lie below 2 000 metres and consist largely of undulating grassy slopes, valleys and gorges, cut by numerous cold mountain streams and rivers. A variety of antelope, particularly mountain reedbuck and eland, as well as troops of baboons are found on the lower slopes, while the bird life is prolific. 4. The northern, central and southern regions each have their own appeal and attract hikers, birders and nature lovers from around the world. Ezemvelo KZN Wildlife has long-standing tourist camps at, amongst others, Royal Natal, Cathedral Peak, Monks Cowl, Giants Castle, Injisuthi, Kamberg and Lotheni. 5. The Drakensberg mountains have a sandstone base, which has been eroded over millennia to form numerous caves and overhangs. Through the centuries South Africa’s original inhabitants, the Bushmen or San inhabited many of these and left behind a priceless legacy of incredible rock art. The most outstanding rock art sites are those in the Main Caves at Giant’s Castle and in the magnificent Game Pass Shelter at Kamberg. Drakensberg Scenery in the Cathedral Peak region of the Ukhahlamba Drakensberg Park. KwaZulu Natal. South Africa. 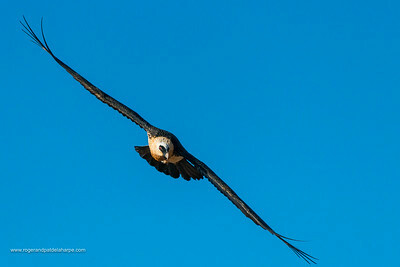 Bearded vulture also known as the lammergeier or ossifrage (Gypaetus barbatus) in flight. 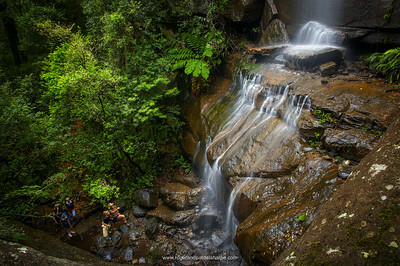 Ukhahlamba Drakensberg Park. 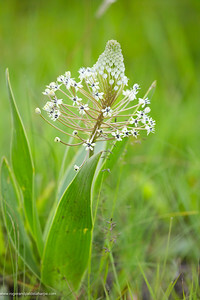 KwaZulu Natal. South Africa. 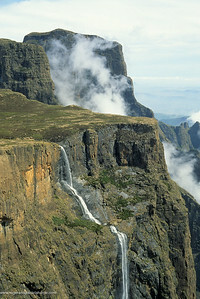 Tugela Falls. On top of Amphitheatre At Royal Natal NP uKhahlamba - Drakensberg Park. KwaZulu-Natal. South Africa.